7. Instrument panel lighting button. A. 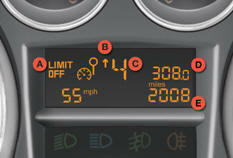 Speed limiter (mph or km/h) or Cruise control. C. 6-speed electronic gear control or automatic gearbox. (miles or km) E. Service indicator (miles or km) then, engine oil level indicator then distance recorder. (miles or km) These three functions are displayed in succession when the ignition is switched on.